Fonte Sole has been central to the community of Nuvolento, near Brescia since the independent family-operated bottling business was founded in 1906 .The Bodei family produce their water only in glass bottles and have a close working relationship with many of the world’s leading hotels and fine restaurants. 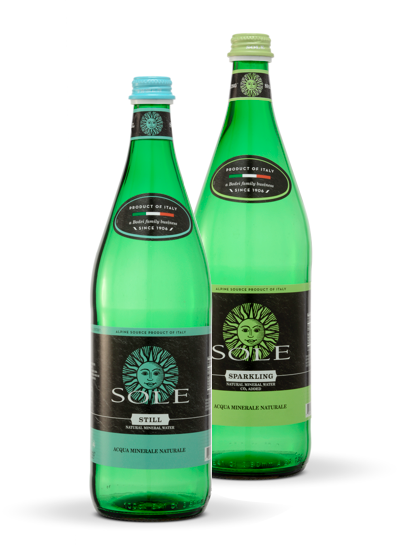 Sole’s delicious tasting natural mineral water is celebrated in particular for its very low sodium content and for being classified as ‘oligominerale’ (naturally low in minerals). 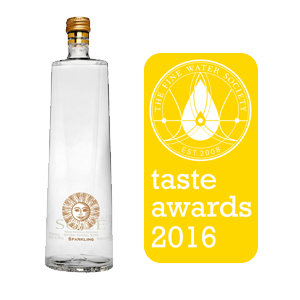 It is an alkaline water that is clean tasting and slightly sweet. The Sparkling enjoys a soft and gentle carbonation. 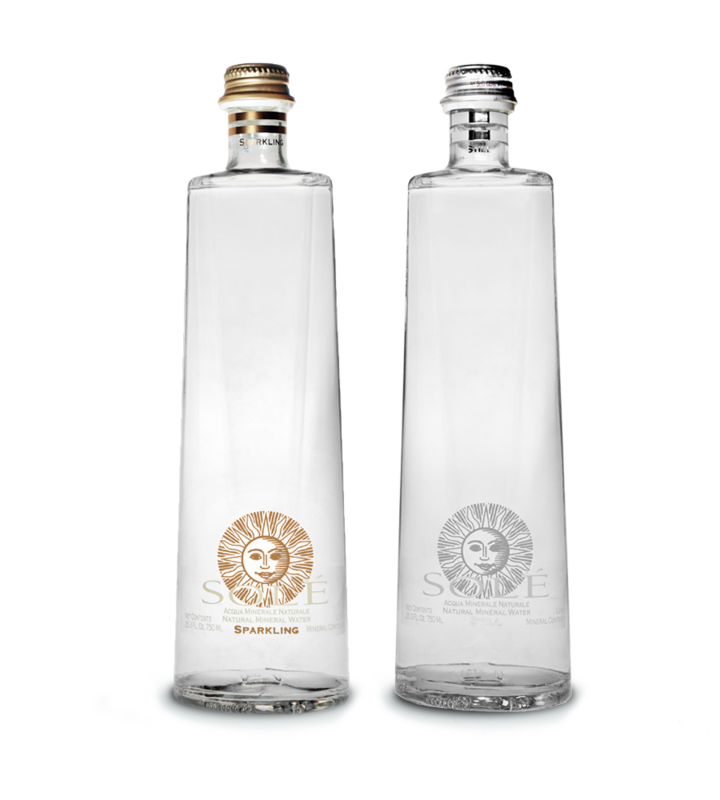 Fonte Sole offers a choice of three beautiful glass bottles, to blend with and enhance any restaurant design style, whether contemporary or traditional. The beautiful, contemporary and super-premium Arte. A sleek, multi-faceted clear glass bottle for fine dining. A highly elegant fluted clear glass bottle that will work perfectly in any dining environment. The authentic Italian green glass bottle with stylish labels created by a young Milanese design house to emphasize our Italian heritage. 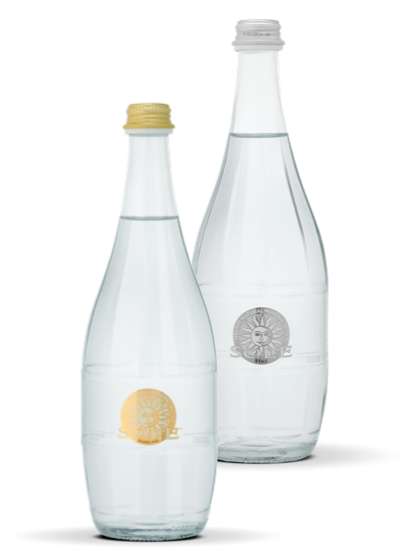 It is worth noting that, unlike many water brands, each Sole bottle presentation is available in both Still and Lightly Sparkling thus creating a visual harmony in the room. Natural mineral water is the highest quality of bottled water. It is defined as bottled water coming from an approved source such as a natural spring that originates from a geologically and physically protected underground source. Mineral water is distinguishable by its original purity and characterized by a natural mineral and trace element content, which is unique to that source and which makes it nutritionally beneficial. The level of mineralization must remain consistent, within the range of natural fluctuations, and the fundamental elements of mineral water cannot be altered. Mineral water must be bottled at the source. 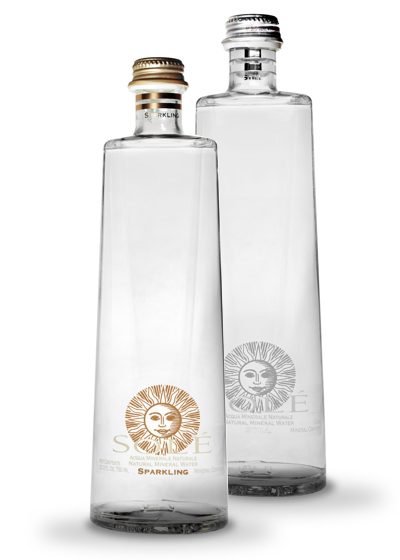 Sole fulfils every requirement of a premium bottled natural mineral water. The well-balanced group of minerals in Sole is derived from a natural filtration process as the water works its way through varying geological rocks and minerals to the underground and well-protected Source. This Source is situated at the foot of the Brescian Pre-Alps that rise to the northeast of Brescia. 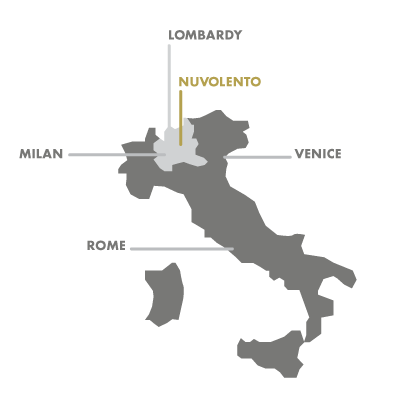 The water from the Source emerges at “Via Antica Fonte” in Nuvolento and corresponds to the point at which the limestone-dolomite formation meets the alluvial deposits from the valley of the river Chiese. It is from this basin that the unique and delicious tasting Sole Mineral Water is sourced. Our water is naturally low in sodium, making it perfect for low sodium diets. It is classified as ‘oligominerale’, low in mineral content. Fonte Sole aims to bring the consumer the highest standards of quality management in all aspects of its production through vigorous quality control and constant innovation. The entire bottling process is a hermetically sealed system; safeguarded to be clean, safe and efficient. 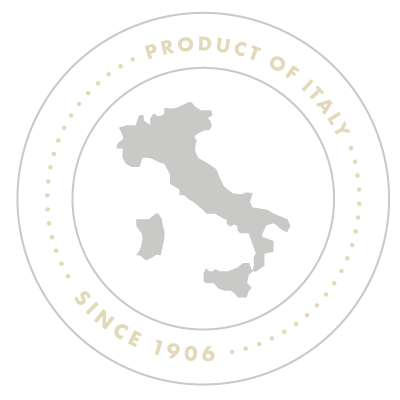 Complying with all legal requirements, both Italian and International, Fonte Sole performs numerous tests at their in-house laboratory on the production process, as well as on the quality of the product itself, to ensure that each bottle of Sole is as pure as its beginnings. If you would like to know anything more about Sole products or would like to enquire about stocking our range of fine waters please do not hesitate to contact us.